The Mountain Rescue Workshop is a minimalist approach to mountain rescue procedures and teaches the access, stabilization and extrication of patients involved in mid-face free or aid climbing accidents, especially those where the accident site is only accessed from below. There is a heavy emphasis on advanced knotcraft (several boutique bowlines) in this workshop. The student will learn how to design and build system anchors from bolts, pitons and active and passive rock climbing camming devices. Strong emphasis is also placed on wilderness improvised techniques where specialized or heavier equipment has no place. Use of whipped and frapped wood frames as high directionals is encouraged, but also the use of the Rock Exotica Arizona Vortex (developed in Sedona, AZ by RTR) is also a main focus of this workshop. 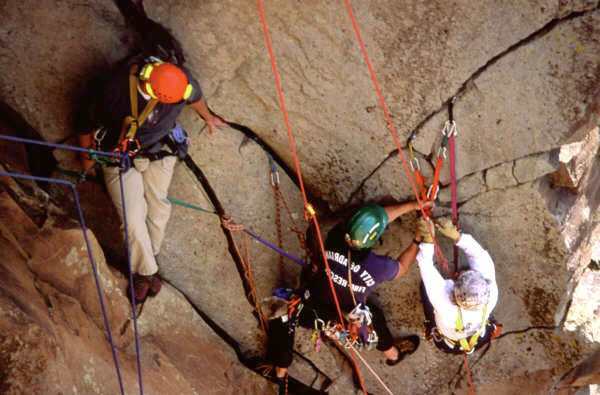 The Mountain Rescue and Canyon Rescue Workshop along with the Team Skills Rescue Workshop are the two workshops which fulfill the 90% solution on most rope rescues in wilderness locations. This workshop is designed for the serious mountain environment rope rescue practitioner wishing to improve their personal and team rigging skill. The MRW goes well into often overlooked personal top down skills involving solo (one rescuer) and semi-solo (two rescuer) victim evacuations employing the rescuer's personal AZTEK kit. Also, the workshop explores the use of improvised low edge techniques for very difficult litter evolutions as well as artificial high directionals in the remote wilderness location. Gin poles, A frames and sideways (SA) frames are common. The crux of the MRW is where students free climb (or ascend) using the bight-carry technique to position a high directional above the victim on a wall. In 2012's MRW, students climbed the famous "Queen Victoria Spire" (5:8) on the Mitten Ridge in Sedona to pull off this difficult task In this way, a heavy and cumbersome rescue adjunct (litter, etc.) can be brought to the victim high on a wall, under them, and then lowered downward (techniques used in tower rescues). Students also learn the classic differences belays, conditional belays and conditional self belays. In the superb rock of the Granite Dells of Prescott, the MRW involves more personal movement on stone and personal rigging skill. Lots of climbing and lots of fun! BY INVITATION ONLY. NO TUITION REQUIRED. We are pleased to offer a rescue rigging program in southern Utah's beautiful canyonlands and slot canyons. 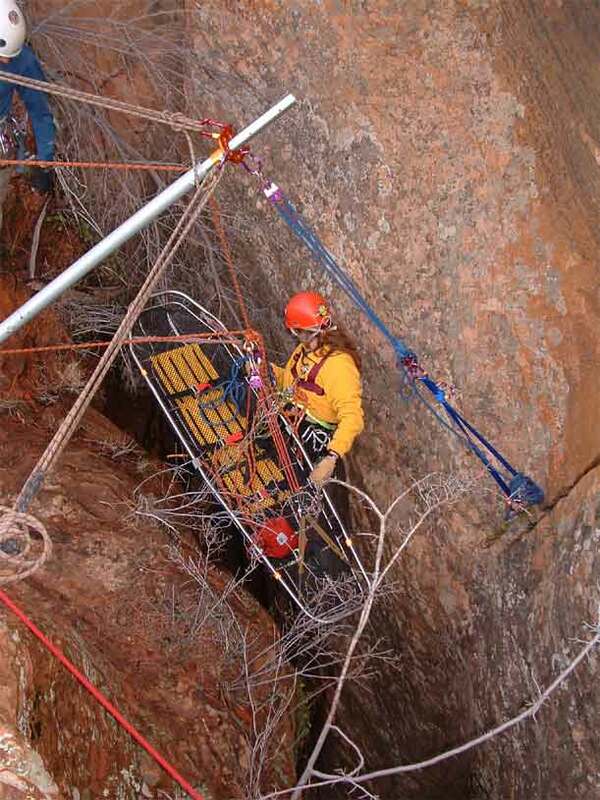 The Canyon Rescue Workshop is specifically designed for the Southwest's sedimentary canyon plateaus and slot canyons (Arizona/Utah/Nevada/Colorado). This intensive program focuses on both personal and team-oriented skills. 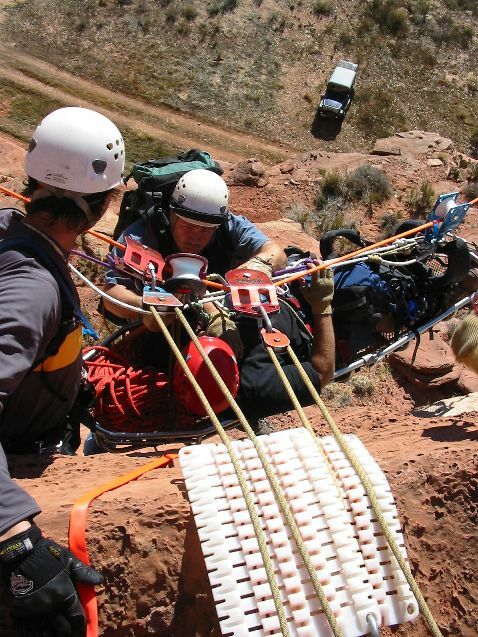 The Canyon Rescue Workshop is a hands-on workshop stressing a minimalist approach to canyonland rescue procedures and teaches the access, stabilization and extrication of patients involved in canyoneering and mid-face free climbing accidents. Students will design and build system anchors from bolts, pitons, sand picket systems and active and passive rock climbing camming devices. Strong emphasis is also placed on wilderness improvised techniques where specialized or heavier equipment has limited application. 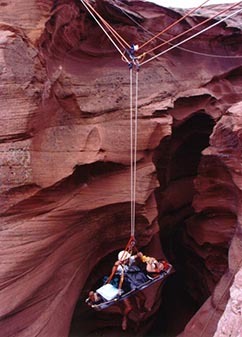 The CRW is designed for the serious search and rescue rope practitioner or park ranger wishing to improve their personal and team rigging skill and is designed for rescuers and teams with every type of possible terrain (including slot canyons common to the Southwestern US) from which a potential victim must be retrieved. Lectures on relative rescue subjects or physics are common throughout the duration of this workshop. Students, as a team unit, learn how to build seemingly complex arrangements for reaching, treating and extricating a patient from the extremely confined canyon environment. Many of these solutions involve high angle offsets and highlines however all do not. All the while, emphasis is placed on building everything from the basic materials most teams will have along: rope, carabiners, pulleys, accessory cord, webbing and know-how. Also extensive use of the Arizona Vortex artificial high directional during this program. Participants must be in good physical condition. Wet suits/dry suits required for participants wanting to venture into wet canyon environments during the CRW. All canyoneering practices will be on minimum two points of contact (main and a safety) during this program. NOTE: Wilderness camping or car camping is available at our slot canyon venue. Porta-potty and full kitchen available with stoves and fresh water but arrangements must be made in advance of the class. This will involve a small cost if you participate which will be shared by the participants. Those wilderness camping must bring tent or other shelter. Many of the mountainous locations in the canyonlands where we hold our practical sessions are far removed from the trail head and often involve a rigorous hike at elevations exceeding 5,000 feet. Some hikes are more than a mile in length and on cross country routes. Camping REQUIRED for participation in this ALL VOLUNTEER PROGRAM. 7 Days - Invitation ONLY. The CRW is all volunteer and there are no fees for this program. "Knowledge is light in the rucksack and not easily left at home"